Remember when I said I struggle with what I am going to make with the apples from the orchard? Well, there is one exception. It is this cake, the Ultimate Apple-Cinnamon Cake. It is so good. I have been making this cake for years and it never fails to disappoint. The cream cheese in the batter makes for an incredibly moist crumb. The original recipe calls for fat free cream cheese. Although I usually go full fat when baking, I do use the fat free cream cheese. Why? Once you have the first piece, then the second, and then a sliver for the third time around, you'll be glad you opted for the fat free cream cheese. 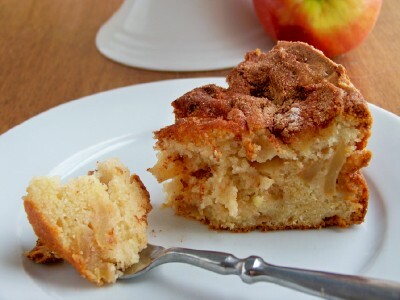 This cake is great for dessert and just perfect for breakfast. However, I must warn you that if you make this cake with the windows open, you will have neighbors stopping by unexpectedly. Go ahead invite them in and share the whole cake. It'll give you a reason to make it again! P.S. Happy Birthday, Sis! This one is for you! Preheat oven to 350º. Coat an 8" springform pan with baking spray. In the bowl of a standing mixer or with a handheld mixer, beat 1 1/2 cups of the sugar, butter, cream cheese and vanilla at medium speed until well blended (about 4 minutes). Add the eggs, one at a time, beating well after each addition. Add flour mixture to creamed mixture, beating on low speed until blended. In a separate bowl combine cinnamon remaining 1/4 cup sugar. 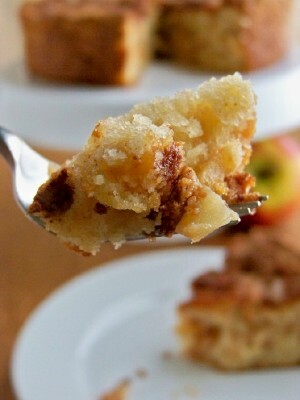 In another bowl, combine 2 tablespoons of the cinnamon mixture with the apples. Mix until the apples are well coated with the cinnamon sugar. Then stir the apple mixture into the batter. Pour batter into prepared pan and sprinkle with the remaining cinnamon sugar. Bake for 1 hour and 15 minutes or until the cake pulls away from the sides of the pan. Cool the cake completely on a wire rack. Once cool, cut the cake using a serrated knife. Enjoy! 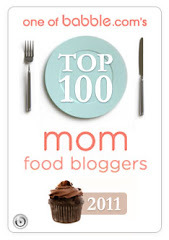 I can't wait to try this recipe. I am providing a meal for a friend coming home from the hospital. She loves fall and apples. 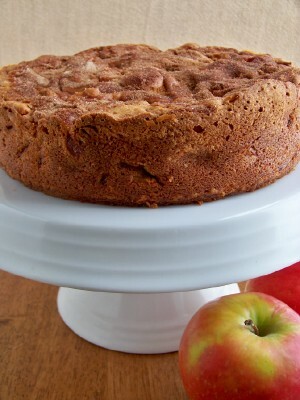 This apple cake will be a winner - easily transportable as well as delicious. I know this cake is going to taste as wonderful as it looks!! I'm in a house full of company in Buffalo, NY where apple picking is a prime activity this time of year and they are in awe of your recipes and your photos!! Hope your friend is doing well. This cake does transport easily and stays moist for several days...if it last that long! What brand of fat free cream cheese do you prefer?